Umm, I've recently figured out that I can make banners, and so request away. Feel free to be as specific with your request as you want, so long as it isn't like 'make a arcues banner lol'. The banners come by default in 350x150, but if you need a specific size, feel free. If you want a specific image or font used, please say so. I guess avatars are also open game. Last edited by Blastoise Fortooate; 04-25-2010 at 05:48 AM. Yey Ima be your first customer. Hummmmm...Hitmontop please, with matching avatar. Even though I already have one. Something like "What goes around.." for the quote. 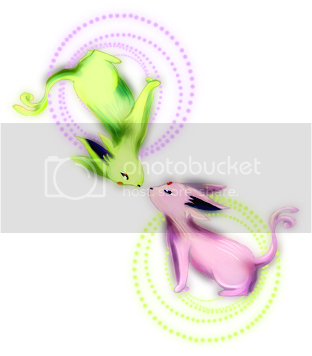 EDIT: Actually, make that quote "Centrifugal"
Last edited by Togetic; 04-11-2010 at 07:08 AM. Yeah they're great, loving the recycle symbol behind him. Can you make me an Espeon banner please? Default size, with the words "Never Give Up"? Do what you will with the background. Thanks! could you please make me a banner with absol with the words: "Disaster is upon us all."? I could redo it if you want...? no it's fine. just meant to say what i was thinking. thank you for the banner. Should be simple. A Houndoom banner that says "Lucidia" in text appropriate to the color scheme of the picture :P I'm not really being specific here 'cause I want you to surprise me ;) If possible, can you give the Houndoom blue eyes please? Lately I've been saying "uber" instead of "awesome." Hm. Could you, possibly, make a Regigigas banner with the quote "Strength is overrated"? Also, is the misspelt 'Arceus' in the first post intentional? Last edited by Squornshellous Beta; 04-18-2010 at 02:43 PM. I totally missed your post, btw, and just realized it. Bombsii: What sizes? And I assume you mean the first evolutions, right? Oh, and please clarify what you mean by 'style'. :3 I like it! Thankies! Oh yeah, obviously I'l credit you, but I'm switching to HTML sig and it may take a while to be approved, so credit'll appear whenever my HTML sig does. Bye now.